New Brunswick singers who wish to apply to the National Youth Choir are normally expected to have participated in the New Brunswick Youth Choir. Every two years the New Brunswick Choral Federation selects an SATB quartet of singers to represent New Brunswick in the National Youth Choir. This critically acclaimed choral program, coordinated by the Association of Canadian Choral Communities in collaboration with Canada’s provincial choral federations and the Canada Council for the Arts, provides a rigorous training and performance opportunity for choral singers aged 18 to 25. Talented young people from British Columbia to Newfoundland apply to sing with the National Youth Choir, four being chosen to represent each province. Some of Canada’s finest choral conductors have directed this prestigious choir, including John Standing (1984), Jon Washburn (1986), Wayne Riddell (1988), James Fankhauser (1990), Elmer Iseler (1992), Diane Loomer (1994), Robert Cooper (1996), Iwan Edwards (1998), Leonard Ratzlaff (2000), Lydia Adams (2002), Kathryn Laurin (2004), Richard Sparks (2006), Julian Wachner (2008) and Dr. Victoria Meredith (2010). The National Youth Choir has performed at the World Symposium on Choral Music, Festival 500 and the ISME International Symposium, and its concerts have been broadcast nationally on CBC Radio 2. Many of Canada’s finest soloists, such as New Brunswick’s own Sally Dibblee, are National Youth Choir alumni. 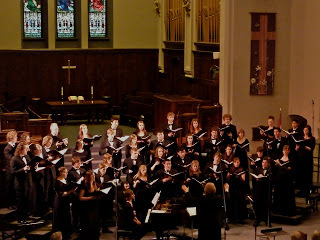 National Youth Choir 2010 conducted by Dr. Victoria Meredith in performance at Knox United Church , Saskatoon, SK.